If tiny, scurrying furries give you the creeps, you've probably never taken the time to learn what distinguishes creatures like a mouse and a shrew. Side by side, there are a few obvious differences, but the two resemble each other enough that you might think a mouse and shrew are related. They're actually from different families, and that's just one of their differences between them. Although they're both small, furry and many times gray, shrews and mice are not both rodents. Mice hail from the rodentia family, but shrews are classified as insectivores. The classifying difference between the two is found in their diets. While a shrew might eat roots, seeds and other vegetation when necessary, his main diet is meat: beetles, crickets, snails, earthworms, millipedes, scorpions, small snakes and birds, mice and even other shrews. Conversely, a mouse will occasionally eat insects like beetles and cockroaches, but prefers his diet mostly vegetarian: seeds, roots, stems, grass and leaves. You'll find mice in many colors including gray, but also ranging from white to light brown to black. Shrews' coats, however, come in one color only: gray. Shrews are usually smaller than mice, and their noses are much more pointed. Mice have large eyes, while shrews' eyes are so tiny they're almost invisible beneath their fur. Shrews have meat-eaters' pointed teeth and small ears compared to a mouse's grooved incisors and large ears. You'll find a long, sparsely furred tail on a mouse; a shrew's tail is shorter with a bit more fur. Shrews have five toes on their front feet and, being rodents, mice have only four. Shrews are considered nocturnal, although they're active pretty much day and night. This is mostly because of their high metabolism. According to Cornell University, shrews have to eat about three times their own body weight each day to avoid starvation. Mice are usually nocturnal but are sometimes active during early morning and late afternoon hours. Mice are social, living together in communities and banding together to defend their territory against an intruder. Shrews, on the other hand, prefer to live the loner's life unless it's breeding season. Mice hit the jackpot compared to shrews where the senses are concerned -- they have a sharp sense of smell along with exceptional eyesight and hearing. Shrews' sense of smell is quite feeble, and their eyes are so tiny and covered by dense fur, they can hardly see a thing. They may be able to distinguish dark from light, but they mostly maneuver using the same technique as whales, dolphins and bats: echolocation. Using a combination of sounds, shrews can get a lay of the land and even locate prey. 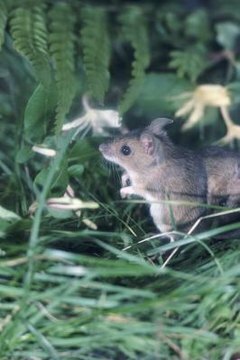 University of Alaska Fairbanks: So You Have Mice -- Now What?